Pauline Friedman Phillips, who as Abigail Van Buren -- "Dear Abby" — for more than 40 years dispensed advice to newspaper readers worldwide on everything from snoring spouses to living wills, has died. She was 94. The improbable saga of “Dear Abby” began in 1955 when Phillips was an affluent homemaker in Hillsborough, Calif., with time on her hands, doing volunteer work and playing mah-jongg. Her twin, who'd just been hired by the Chicago Sun-Times Syndicate to take over the Ann Landers column, began forwarding some of her letters to her for replies. Always extremely close, the sisters were thrilled to be collaborating on an advice column. 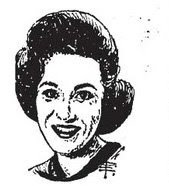 Phillips soon started her own advice column for the San Francisco Chronicle. Her twin sister died in 2002.